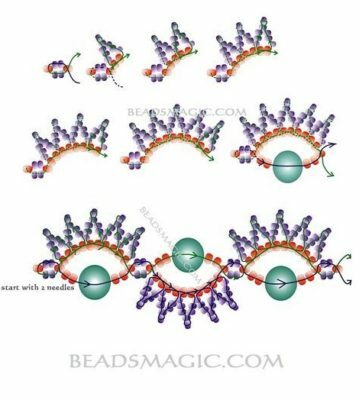 This beading pattern / tutorial really caught our eye! 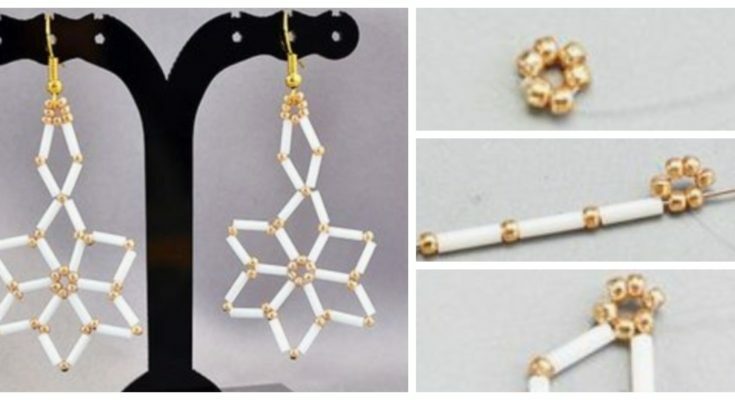 It’s so elegant due to using long beads, so pretty because of the alternating flowerlike use of gold spheres and white lengths, and so appealing because it’s unusual and creative. This beading pattern can be used as beaded earrings as is done here, but also as a pendant, or even, if you make the flower small enough, strung together as a bracelet. This pattern is by Panda Hall. They’re big enough that we’ve indexed them in our Crafters Resources page here. To make this beaded bracelet, you basically are threading two strands and crossing them over each other at regular intervals! It’s a simple concept! You pull your string through your clasp end so that you have enough string length on BOTH sides of the clasp. Now you put both strings through one bead, then branch the two strings off: Put 3 beads (alternating colors) on one side and 3 on the other, The put both through a new bead, and you’ll have completed one loop. You just keep going like this until the end, and you’ve got the basis of the bracelet. One more pass for the extra flower or leaf designs. This beaded bracelet free tutorial is by “Beading Tutorials,” who we’ve indexed in our crafter’s resources. Here’s their video for more instruction. This is an elegant, but also spicy, beaded bracelet pattern that uses mostly small seed beads, but also a few larger beads. In the photos, they use a pearl like sphere, but you could use any larger bead you want to showcase, or even letter beads! All you need for this one is: 11/0 and 10/0 seed beads and your larger beads (pearls used in the one shown are 10mm). This is obvious but you can just add segments to this bracelet until you have the size you want. This pattern is by BeadsMagic, obviously! We’ve indexed them in our directory of beaders and beading resources (click here). Or click here for more beading ideas.